In 1996, Nigeria made history at the Olympic Games, becoming the first ever African nation to win the gold medal in football. By itself, it was a staggering achievement, but context only embellishes it. Following her debut in 1968, Nigeria appeared in the football tournament twice more preceding the Atlanta games. On each of those three occasions, the African giants had been eliminated at the group stage; even worse, nine games had yielded two draws and seven defeats against great (Brazil, Spain) and modest (Australia, Japan) opposition alike. In that sense, 1996 served as a rubicon, a jarring point of inflexion following which Nigeria has come to be viewed as a favourite rather than a doormat. Twenty years on, the quest for new Olympic heroes resumes, albeit with less fervor than previously: expectations are modest, more so considering the team’s preparation, which has been mired in uncertainty and typical shoddiness. 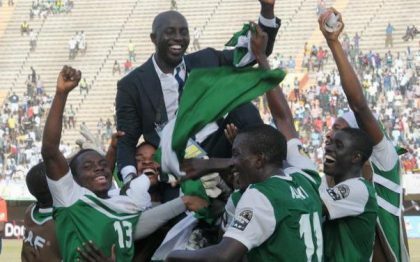 Nigeria go to Rio as African champions at U-23 level, having emerged victorious from the first edition of this qualification format in December 2015. It was, however, hardly plain sailing. The team found itself habitually prone to a second half drop in efficiency and output—having romped to a 3-0 first half lead in the opening game vs Mali, they ended the game rocking and hanging on for a narrow win. The theme played out in the second game as well, as Egypt came from two goals down at half time to draw 2-2. Then followed an uneventful goalless affair with Algeria, but they would resume hostilities in the final two games later—the West Africans coming out 2-1 winners thanks to a brace by Oghenekaro Etebo. The explosive midfielder was also the hero from the spot in a semi-final that saw Nigeria comprehensively outplayed by Senegal. Oghenekaro Etebo: Already mentioned, the Portugal-based midfield powerhouse was deservedly named MVP at the U-23 AFCON, and finished the competition as top scorer. His powerful, bold running with the ball from behind the main striker is a major weapon, and he is a nerveless penalty taker. There is a doubt surrounding him, though, and it is that he has not featured a lot in the preparations to date, including the team’s camping in the USA. However, it is clear that from the 18-man list handed in by Siasia that preparations so far have been more about pruning than strengthening connections and team-play. He will almost certainly be the first name on the teamsheet. John Obi Mikel: The stipulation permitting each team three over-aged players has created an opportunity for the Chelsea midfielder to appear at the Olympics, having missed out in 2008. The centre of the park already is home to Okechukwu Azubuike, who is team captain and a quite delightful player, but there has been uncertainty over who should partner him. As captain of the senior national team, Mikel brings the sort of calm and discipline that will serve to unlock the forward players, allied to a fine range of passing and oodles of experience. Emmanuel Daniel: It is usually a worrying sign for a team to look to its goalkeeper as an important component. However, a slew of injuries and drops in form means Nigeria go to Rio with an untested backline. William Troost-Ekong is already a full Nigeria international, but is lacking in the experience stakes, while the wonderfully-named Saturday Erimuya is 18. This will place a lot of responsibility on Daniel to organise and keep them alert. He produced some superb performances at the U-23 Afcon, and is quick off his line, as well as being a very handy shot-stopper. His positioning is not always the best though. Siasia favours a 4-4-2 system, with one striker playing deeper and buzzing around a more advanced partner. His best teams are almost typically Nigerian in the mid-90s fashion, devastating going forward, but criminally open and prone to errors in defence. Nigeria won gold in 1996 following a seven-goal, extra time thriller against Brazil in the semis, and a 3-2 win over Argentina in the final, but this team has nowhere near the same quality, and could perhaps benefit from reining it in a bit. The sheer numbers this team is willing to commit into attack is sometimes frightening: the two forwards, naturally, as well as the wingers (Siasia often goes as far as playing converted strikers there); even both central midfielders have been known to storm forward: this team scored an absolute peach of a goal at the All Africa Games against Ghana after Azubuike played a one-two on the edge of the box with his midfield partner Kingsley Sokari and the latter finished calmly. The system is very fluid, and the width of the 4-4-2 works perfectly to stretch the opposition. It can sometimes look a complete mess, a blur of green, but when it clicks, this team can overwhelm the opposition. The inherent openness once the ball is lost is a huge weakness though, and places a lot of strain on the centre-backs to be proficient in duels, both on the ground and in the air. It may sound rather intuitive, but this team cannot afford to have to chase leads in Rio, as they can get absolutely cut to ribbons on the counter. Set-pieces are also an area of concern, as there are frequent losses of attention: the sooner Siasia addresses this, the better.